This article is the summary of a presentation given by Dr. Al-Suwaiyel at Oxford University. The presentation provides an insight into the works of Muslim Scholars on Cryptology in early Islamic periods. Cryptology, the art and science of making and breaking codes, has a history that is older than 4000 years. The first mention of cryptology in a formal sense started in the 9th century CE, by Arab Cryptologists. They designed new codes and systematically described the methods to break the codes, i.e. cryptanalysis. David Kahn, a prominent historian of cryptology, wrote in his 1967 book, “The Code Breakers - The Story of Secret Writing”, that "Cryptology was born among the Arabs". Kahn's statement was based on references in Al-Qalqashandi’s encyclopedia, titled Subh Al-A’sha fi Sina’at Al-Insha’ (The Dawn of the Blind in the Writing Industry), written in 1412 CE. Almost all of these references were based on a manuscript by Ali ibn ad-Durayhim written around 1350 CE, titled “Muftah Al-Kunuz fi Idhah Al-Marmuz” (The Treasures Key in Deciphering Cryptograms). Ibn ad-Durayhim's book was thought lost at the time. In 1979, Drs. M. Mrayati, Y. Alam and M. al-Tayyan, from the Arab Academy of Damascus, decided to verify the truth of Kahn’s statement and searched for Ibn ad-Durayhim’s lost book. They discovered a treasure! Not only they found Ibn ad-Durayhim’s book, but they also discovered more than 15 Arabic manuscripts on Cryptology written in the period 2nd to 8th Hijri centuries, i.e. 9th to 15th centuries CE. Most of these manuscripts were found in the Suleymaniye Ottoman Archive in Istanbul, Turkey. Volumes 7 – 9 will be published soon. Among those manuscripts is the oldest existing cryptologic text written by Ya‘qub ibn Ishaq al-Kindi ca 850 CE, titled Risalah fi Istikhraj al Mu'amma (Treatise on Decrypting Cryptographic Messages). Al-Kindi’s Treatise shows that the Arab scholars’ interest in their language led them to study aspects that aid in Cryptology like Linguistics, combinatorics and statistics of the Arabic alphabet and words. The linguist Al-Farahidi, (100 – 170 AH / 718 - 786 CE), used principles of permutations and combinations to list all possible Arabic words with and without vowels in his Arabic dictionary Al-Ayn. Al-Kindi showed how to use letter frequency analysis to break substitution codes almost 1200 years ago! The discovered manuscripts also show that Ibn Adlan, (died 666AH / 1268 AD) and Ibn ad-Durayhim, (died 762 AH / 1359 AD) designed cryptologic systems similar to those by G. Porta (1535–1615 CE), Blaise de Vigenere. (1523 –1596 CE), and G. Cardano (1501 – 1576 CE). A manuscript by Ahmad ibn Wahshiyyah (291 AH / 914 CE) titled “Shawq al Mustaham fi Ma’rifat Rumuz al-Aqlam” (Seekers Joy in Learning about Other Languages written Symbols) identified 93 alphabets and symbols, among them Hieroglyphics. 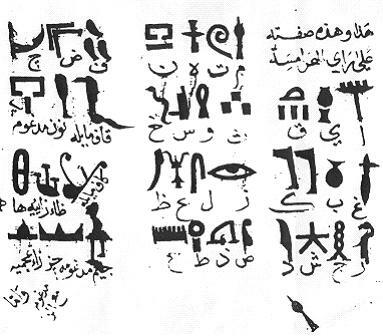 Ibn Wahshiyyah decoded about half of the Hieroglyphic alphabet, and noted that the symbols. Professor Okasha El Daly of UCL’s Institute of Archaeology, London, noted that Arab scholars correctly interpreted hieroglyphics in the ninth century CE, almost 1,000 years before Jean-Francois Champollion. The Arab scholars work on Cryptology was not an individual effort. It formed a “School” of Cryptology that thrived for centuries. The scholars learned from each other, added their own original contributions and forwarded the works to others. 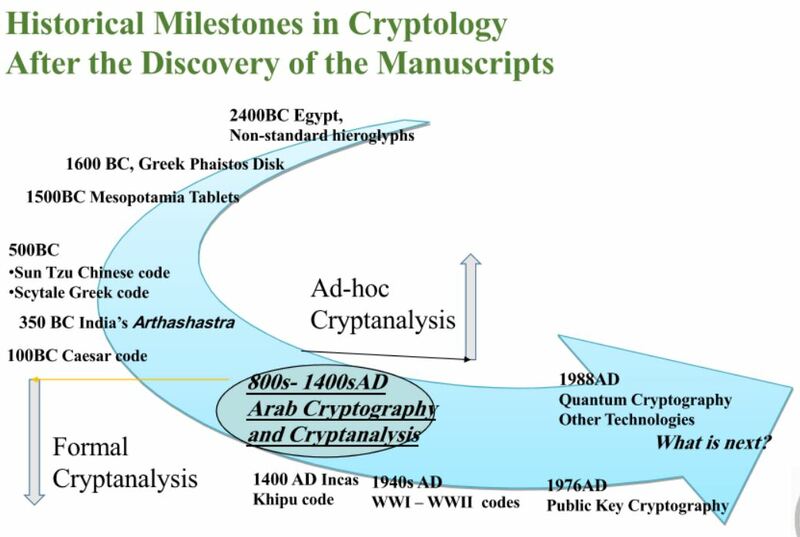 The discovered manuscripts corrected the history of Cryptology by pushing its origins back by more than five centuries, and substantiated Kahn’s statement that "Cryptology was born among the Arabs". The presentation given by Dr. Al-Suwaiyel to an audience at Oxford University can be accessed here.